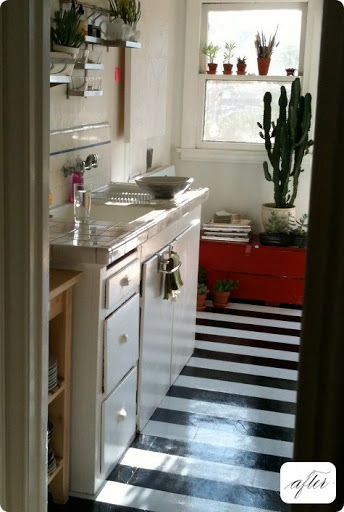 I got this photo from Design*Sponge a long time ago, (in fact, I can’t remember if I’ve posted it here before or not), and really love the black and white floor. I would love to tear out the horrible and peeling floor in our bathroom and replace it with something like this. Is having stripes on one of our bedroom walls and on the bathroom floor too much? The two rooms are separated by a long hall and two other rooms, so it might not be. < Previous Don’t mind if I do. Next > It’s been a while.